Patio Master: dedicated to making and supplying made to measure high quality PVCu doors. Our products rank among the most highly specified and rigorously tested in the market place, thermal insulation, durability and weather tightness, on our enhanced security sliding door range. Our reputation for high quality products has enabled us to become one of the UK’s leading door manufacturers. Our range of double rebated uPVC French doors are available in a wide choice of styles with a performance, which outlasts other brands. Fully sculptured and moulded, our doors have flush fitting gaskets for that traditional look, which is far superior in finish to “standard” uPVC door systems.With a matching range of leaded, bevelled and decorative glass inset features, Compositedoors have a door for every home. 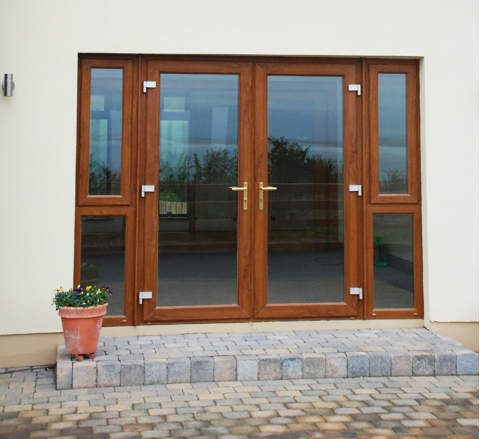 Each door is also carefully specified to feature the security options you choose, making your home safe and secure. Low Threshold option removing any potential trip hazard. Slim profile doors that fold flat onto each other. Multi point locking system with flush handle operation. Polyester powder coated thermally broken aluminium construction.